I’ve never really been a fan of radishes…until I let them ferment. Now, I can’t get enough of these little crunchy gems. Add them to salads, lettuce wraps, or just eat them straight out of the jar! Prepare your jar by thoroughly washing and drying it. Prepare the salt water brine by warming the water to just about boiling point. Place salt into a large bowl and pour hot water over the salt. Gently stir and allow salt to dissolve. Set aside to cool completely. Prepare radishes. Wash radishes and remove stem and root ends and then cut into thin slices. Pack the radishes and garlic into the prepared jar. Add in prepared and cooled brine. Pour water over the radishes, leaving at least 1” space between the brine and top of the jar. Gently insert a knife in and out of the jar to allow excess air to escape and water to get in between each radish slice. 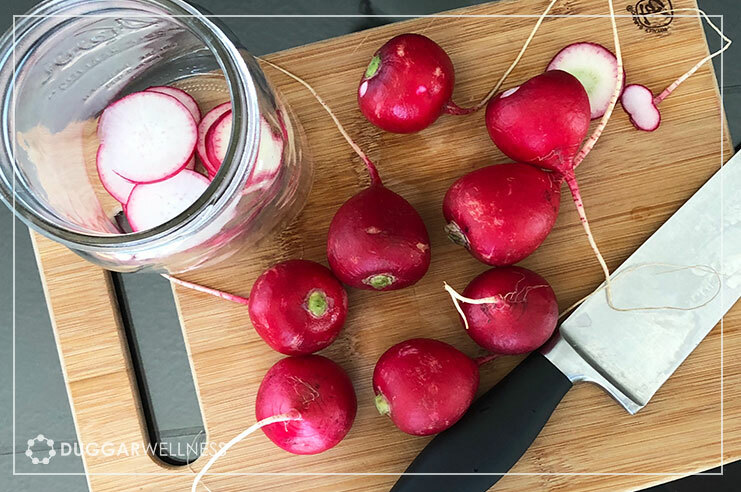 If the radishes float to the top and do not stay fully submerged, place a weight in the jar to keep radishes under the brine. Leave at room temperature for 3-7 days. This time frame depends on the level of sourness you prefer. Make sure you open the lid and “bump” your jar every day, unless you are using a fermentation air lock lid. “burping” will allow excess carbon dioxide to escape reducing the chances of a jar explosion. When they’re fermented to your liking, remove weight and replace lid and store in the refrigerator.